At our visit to the Adva Center, we learned about the role of the Mayor's advisors on women's issues, a position every municipality is required to have--but only a handful fund as a full-time position. 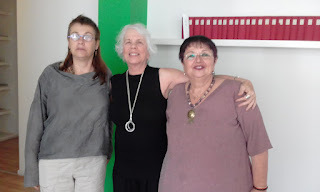 Edna Sabag, of the Beersheva Municipality, above right, is one of those rare women. Along with Adva staff, also pictured above, she has created a network for these women. Their new project, which is funded by the Foundation, is to improve the environment in the Negev for Jewish and Bedouin businesswomen. Three businesswomen from each of 20 cities in the region will create locally tailored efforts.